THE STORY OF SHOLA: HIV/AIDS DISCRIMINATION IS STILL HERE! Ms. Shola has full blown AIDS. She is poor, sick, abandoned, evicted and HOMELESS! 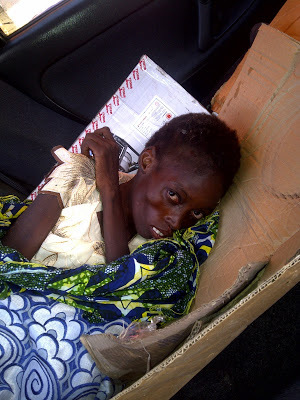 She used to sell bread at Adeniji Adele area of Lagos State. Her problems got beyond her when the “shack” she called home was demolished by Fashola’s demolition-happy officials without providing her an alternative shelter. f her ears attracted all kinds of flies. Gladly, two women summoned up the courage to approach her and cover her up with warm clothing. As I walked away with a tinge of regret about my inability to help, somehow, I believed the local authorities would come to her rescue in a matter of days. I WAS WRONG! Just yesterday, Thursday, October 27, 2011, I learned that Ms. Shola had been ‘living’ at that same spot for over four weeks. Touched by her deteriorating physical and health condition, members of St. Vincent De Paul (SVDP) movement of Joseph’s Catholic Church Egbeda took her to Igando General Hospital and Gowon Estate Police Station. Both the hospital and the police station vehemently refused to keep her in their custody. They also took her to National Institute of Medical Research, Yaba, Lagos and all known shelters in Lagos State yesterday, none agreed to admit her. As a pre-condition for admission at IDH Yaba, Lagos, they were requested to pay N50,000 deposit, and submit the name of a relative that would take care of her. 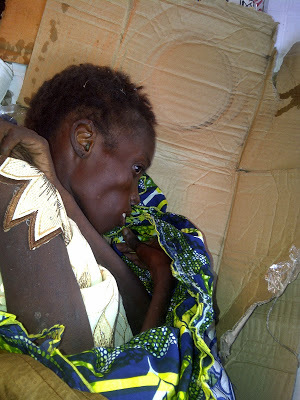 Despite paying N50,000, she could not be admitted into the shelter because none of her relatives showed up. Having exhausted the whole day and options available to them, SVCP’s attempt to return her to Egbeda Bus Stop met a brick wall. Traders and persons claiming to be local government officials refused to let her stay at the bus stop on the grounds that she constituted a public health nuisance. The furore lasted well into the night until the nearby Catholic Church offered her a place to sleep. To say the least, it is appalling and embarrassing that there are no functional destitute homes and temporary shelters for sick people in the whole of Lagos State despite its enormous internal and external revenue earnings. State and local authorities have continued to push for, and advance policies and programs that skew focus on city beautification and aesthetics even if it is at the cost of massive social dislocation and human suffering. Development has no value if does not lift people out of poverty. Development is meaningless if it does not enable its intended benficiaries to live more properous, healthier lives. Ms. Shola may not live very long. And when she’s gone, beautiful flowers may quickly be planted along Mobolaji Bank Anthony Way, Ikeja, Lagos to replace her. Certainly, Lagos shall not miss her! Good bye Ms. Shola…We may not meet again. But your story would would forever haunt the conscience of leaders who failed to live up to their expected obligations towards you.